You know what makes total sense? Sewing up a cute summer top in a luxurious lawn when the thermometer reads a grand total of 15 degrees. Oops. Whilst I may not be smart when it comes to sewing for the weather but I do know how to pick my fabrics and patterns – check out the season defying awesomeness (and super chilly photos) right here! This is the Datura Blouse by Deer and Doe. This Datura is a semi-fitted sleeveless blouse with buttoned lower back. Version A rocks some sweet triangle cutouts at the neckline and Version B has a Peter Pan collar. I know I’m on a bit of a Deer and Doe rampage of late but real talk: it is so nice to have (re)found a company that has an aesthetic I consistently dig and also drafts from a block that matches my shape. Not having to do FBAs and grade between sizes for my waist is freaking rad! Lazy sewing for the win! Can we talk fabric for a sec? 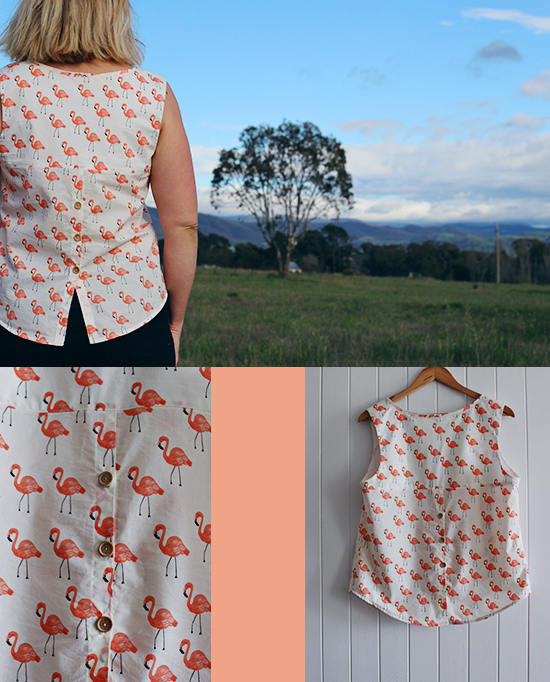 This flamingo print goodness is the stuff dreams are made of! My new best fabric friend is from the Rifle Paper Co line put out by Cotton + Steel recently and may or may not have been an impulse purchase after a crazy 10 hour work day. I grabbed 2m from the awesome Miss Matabi for the Datura but found it is so sheer that the flamingos could be seen through when layering fabric. As a result I used white voile for the internal yoke and now have about 50cm left. What shall I do with it? Who knows! Actually, does anyone have a suggestion on on something cute to make out of 50cm of voile? Construction wise, this wasn’t too bad to put together. The fact I used the English instructions rather than the French (like I did with the Melilot) was also helpful. Teehee! The only alteration I made was to shorten the darts by 2cm but inside I could have gone another 1cm in the length department and dropped them by 3cm. Oh well, you live and learn! There is one step in the instructions that is a little finicky and that is getting your pointy parts (aka dinosaur scales) looking good. I marked out the stitch lines before constructing this and trimmed and snipped the points as close as possible. There is still a little pulling at some of the points but I’m not too worried as isn’t noticeable at a distance. Yay for personal space bubbles hiding sewing mistakes! Also, don’t forget to pull your bias binding a little tight around the neckline between the scales or it will flop open and you will be pulling your seam ripper out. Blergh! The fun details. Pointy dinosaur scale win! Maybe I’m finally evolving into a Sewasaurus? The armholes. This sounds so odd but they seem to sit really well. There is no bra peekage, no seams digging in and pretty much only happiness in my arm meat area. The crazy neat yoke situation. You could almost wear this sucker inside out it is that stylin’ inside! French seam this sucker. Because a lady deserves a nice finish. And also it is lazier to do then drag the overlocker out! Contrast fabric. This is the perfect pattern match for some fun colour and print blocking. There are so many gorgeous variations out there! Overall, I love this top! The sassy details are fun, the button back is cute, the armholes fit like a dream and it is blouse with a bit of fit and structure. I am already planning on making up a few more of these in some crazy fun prints for summer. Though, once you have gone flamingo can you ever go back? Ka-kaw! Very nice! Loving the dinosaur scales. Definitely more of theses needed, but you’re right, where to go after flamingo.. Very cute indeed. I’m sure you’ll find another lovely tank pattern to use up that extra 0.5m – maybe colour blocking a yoke or something. Otherwise flamingo pockets would be lovely! 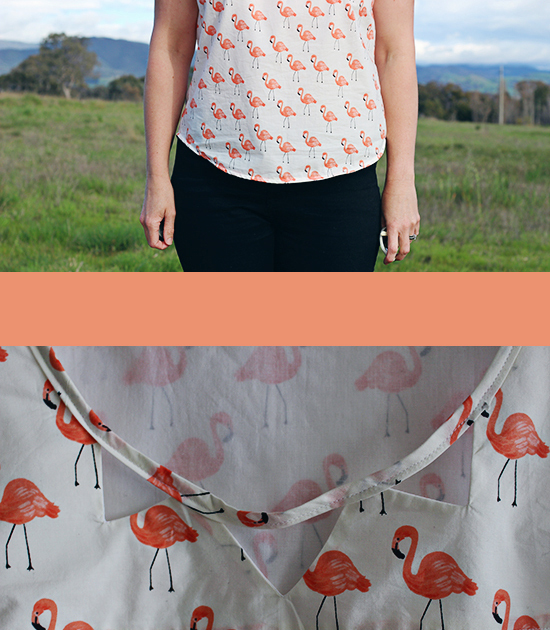 Colour blocking may be the way to go – I’m keen to try the Penny from BHL so this may be a winner! I loved your blouse so much I promptly skipped over the Deer & Doe and placed my order! It’s gorgeous! Like you said there are so many bits of interest in this pattern and a perfectly cool top for summer – although I’m actually heading into winter! – I still like to have sleeveless blouses around. They are comfortable and I love the little extra challenges in this pattern. Thank you! I laughed out loud at casual Canberra lady cargo! 😀 I love everything about this top and I need to make myself one so bad! Teehee! It is such a fun and quick one to make up – gotta love a Sunday afternoon win! Boom! Birds of a feather and all that 😉 Too cool! Have some silk I might try, as the pattern looks like it might fit my ‘girls’ well but still chilly here in southern Victoria. Ohhh! A silk version would be fiddly but so worth it! It is still rather chilly here in the Berra – I was back in my polar fleece straight after these photos. Eep! Beautiful! I bought some of this fabric too but hadn’t decided what pattern to use with it, Datura is actually on my short list so I love seeing it actually made up. TOO CUTE. Thanks, Katryna! The fabric is sooooo lovely to work with! I bet you’ll make something AWESOME! 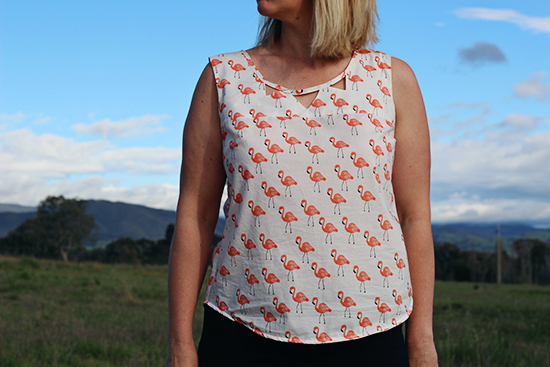 This pattern has been on my to sew list for a while, you’ve made a beautiful version, loving the fun flamingos. I’ve not sewn a D&D pattern and now I’m wondering if they might fit my shape better as always need to change them, there’s only one way to find out, I need to get ordering! So cute and ready for hot weather! That fabric is amazing and works so well with that pattern. Haha! You’re so cute! that is the most adorable print, EVER! And hoo boy can I relate to some seasonally inappropriate sewing… I think we’re just willing it to come sooner with all our summery little creations. COME ONE SUMMER!! I love this on you! Suits your personality perfectly. Also flamingos are pink feathered dinos, right? Ka-kaw!! What a cute top! It catches my eye:) I especially love your fabric choice. Very lovely. Great Datura! I also had some troubles with the bias binding and had to sew it twice! I was thinking you could make an snood with your left over fabric adding white fabric on the inside,,.. If your leftover length allows…. Otherwise a color blocked top. I have been hoarding my scrap and am planning to use it on a colour blocked top. It is so lovely and cool to wear!